Contrasting dramatic and inventive storytelling in a lively showcase of modern ballets. Ingoma (Song), created by company dancer and choreographer Mthuthuzeli November is a fusion of ballet, African dance and singing. This première and Barbican co-commission portrays a milestone moment in South African history and imagines the struggles of black miners and their families in 1946, when 60,000 of them took courageous strike action. 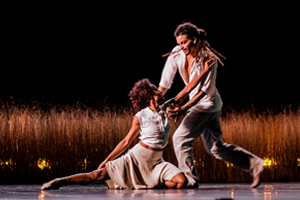 Ballet Black reprise Martin Lawrance’s “wickedly intelligent” (The Guardian) Pendulum – an intimate duet which premièred in 2009 and the choreographer’s first work made for the company. An original, light-hearted work by Scottish Ballet’s choreographer-in-residence, Sophie Laplane, also a première, completes the Triple Bill. Please note this programme replaces the previously announced Double Bill with Luca Silvestrini. Stay in your seats after the show for a FREE post-show talk following the performance on Thu 23 May.